Modern touch is added to this Mediterranean Tuscan home. 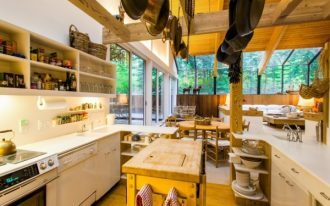 Here, we’ve seen that the owner still uses the original Tuscan by architecture and materials. But, it looks little different on windows and door in which both parts are completed with best-quality glass panels. Glass panels here are commonly used in modern Tuscan home design. 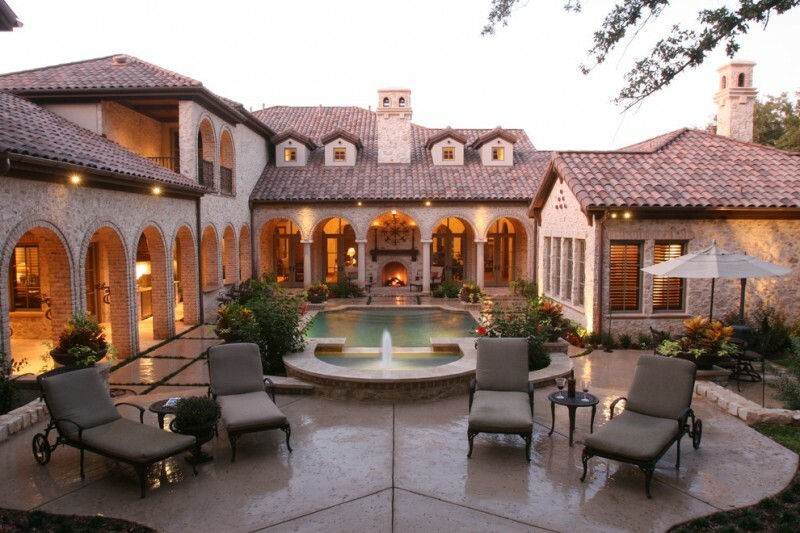 And overall, the design is still dominated by genuine Tuscan home style. It must be wonderful if we add such tower entrance into our Tuscan-style home. It’s good idea to welcome friends or guess warmly here. 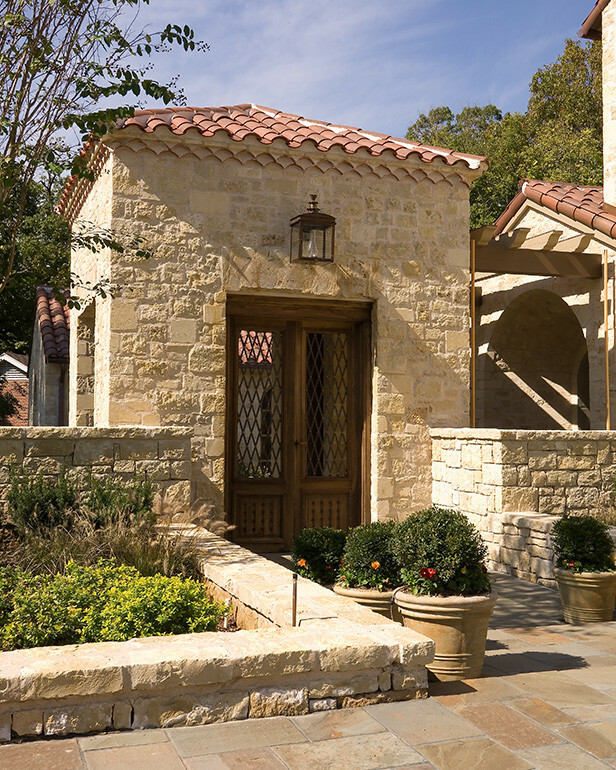 Like other parts, this entrance tower is built from beige-toned stone for walls, dark beige-toned roof installation, and earthy brown wooden entrance door with lightweight metal net panels. The door entrance is designed in different model. Unlike common Tuscan-style home’s entrance doors with their curve shape on top, this one is curve-less like common doors. Beige is the primary tone and it is perfectly combined with similar tones but different details and materials. Decorative copper accessories installed as roof’s details, for instance, offer luxurious exterior addition. 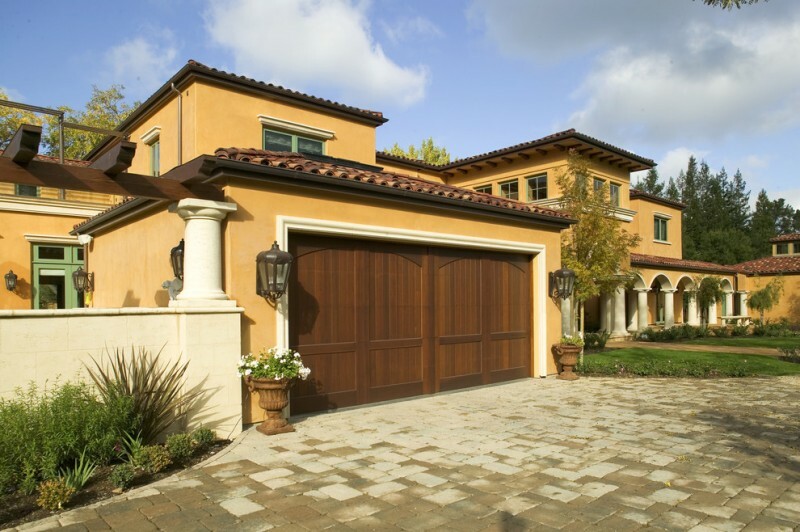 Flat-stone siding featuring cedar garage doors are best collaboration to create a strong Tuscan concept. Both have dark-finishing as fabulous as the main building. In addition, the series of wall-lights with warming visual illusion create dramatic ambiance for each corner of building. 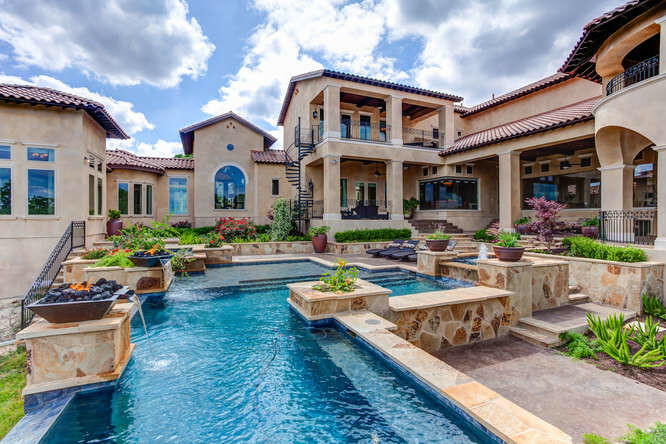 A large and luxurious Tuscan style home commonly has extra back-space for yard and pool. Huge pillars built in Victorian style and simple & minimalist white-framed pool are obvious examples how a Tuscan-style home frankly suits to pair off with any styles. Make a note, make sure that just give a little touch of other styles. Why? Too much proportion of non-Tuscan styles just make the original Tuscan slowly disappears. Just see the picture in more detail, the building is equipped with black wrought iron entrance door and keep existing Tuscan’s original look such as high and curved-top windows and door, terracotta roof installations, exterior wall details, and beige stone installation for exterior path. These are the main values of Tuscan house itself. 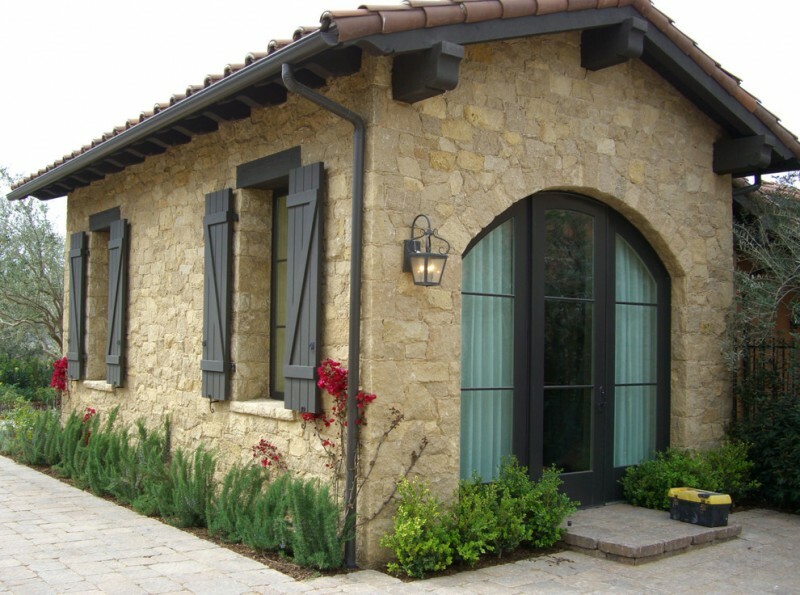 Stone and stucco walls still become the main materials of Tuscan-style building. This one has copper accents applied on rails system. Dark glass windows here gives a contrast look over the light-beige stucco walls. 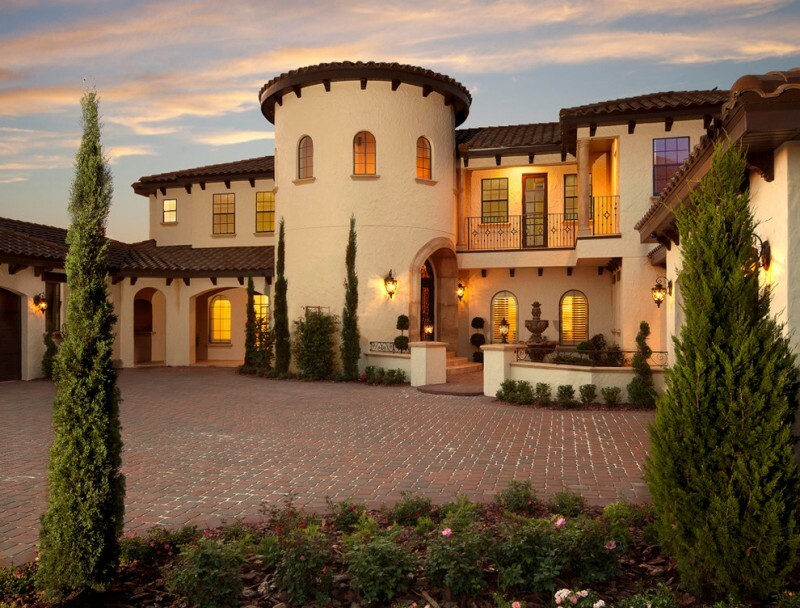 Simple yet stylish, and of course still reflects a stunning Tuscan-style house. 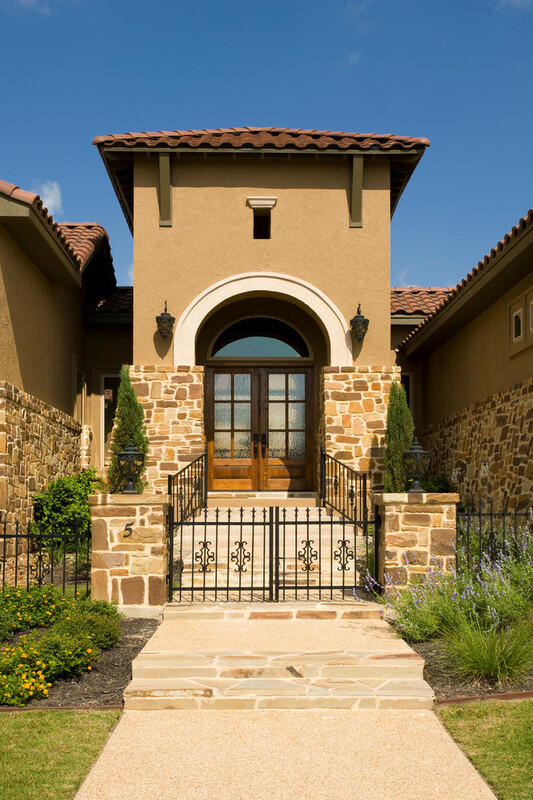 Luxury comes from black wrought iron rails installation and walls’ layout that adapt half-stucco and stone model. It’s clearly seen at the entrance tower where we’ve welcomed by firm and luxurious railing systems and dark-toned wooden entrance door at forward. The door is much more dramatic and classy with blurred glass panel. 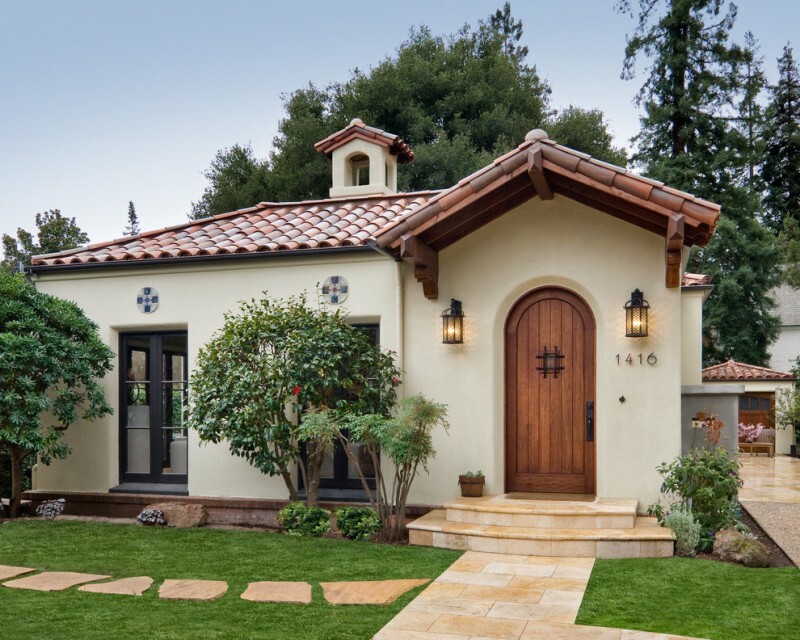 To create similar tone, the owner covers the front path with stucco and stones in regular patterns. What makes it different is in the windows. The owner love painting the windows’ frames in vivid color accents like blue. 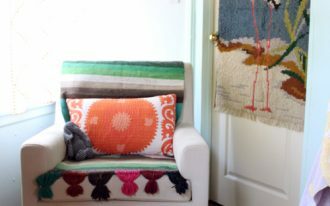 Blue is obviously contrasted to Tuscan house’s genuine tones (beige, earth brown, copper tones, and other similar tones). It’s possible that blue is an accent to enlighten the house facade. It’s simpler than other common Tuscan-style houses. There’s no rails system installed to border the house from surround. Such idea is a simple way to welcome anyone (friends or families) who want to come and have fun there. The owner chooses nature stones as the outer part displayed on house, while stucco walls are used for inner part like porch. 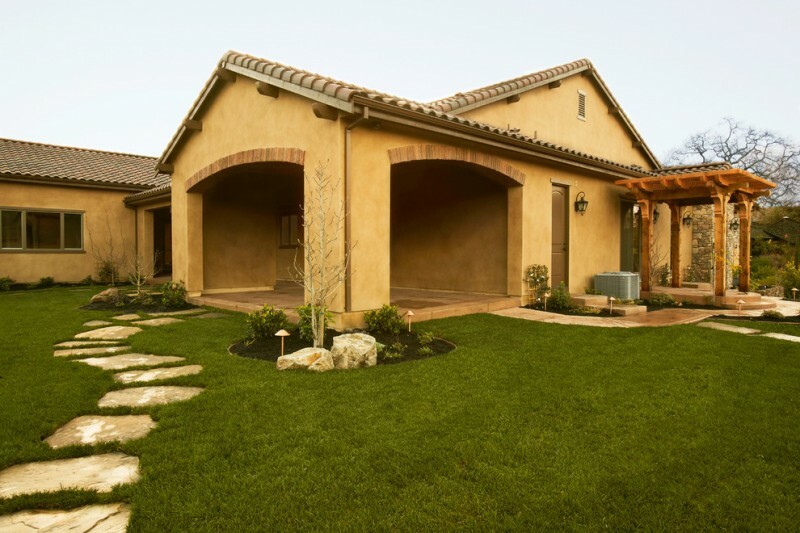 It’s a great idea to build a stucco path to highlight the Tuscan house exterior. It looks so striking over the yard grown by vividly green yard. Giant and panel-less doors with curved top are other typical characteristics usually installed on Tuscan-style houses. 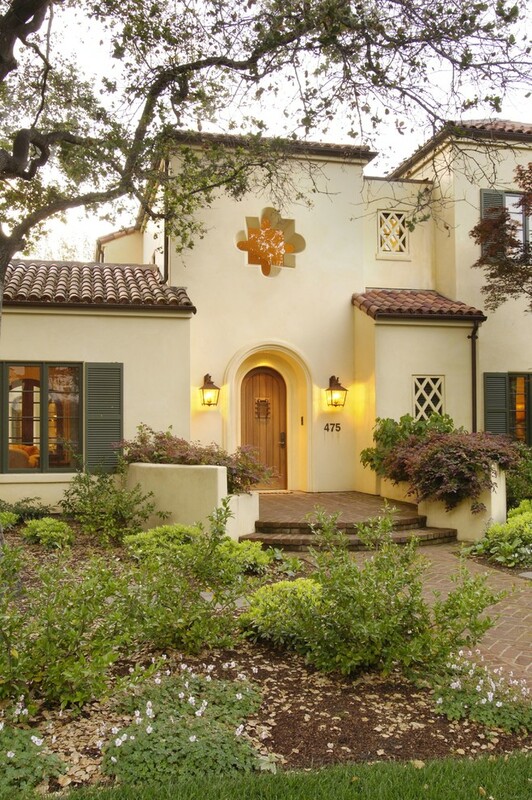 Yellow stucco walls here display little different look of Tuscan custom house. 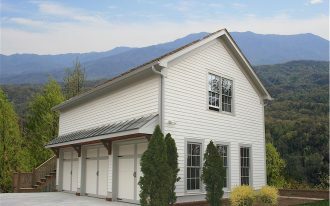 The house has a grand garage unit with dark reclaimed wood garage door. Dark terracotta roof installations add more beauty and harmonious visual appearance for the whole building. One that makes this house different and unique is that it has multi-level roofs and use dark yellow concrete walls. It’s rarely to see these things on a Tuscan home, but if you want, customize it with any additional elements you like. 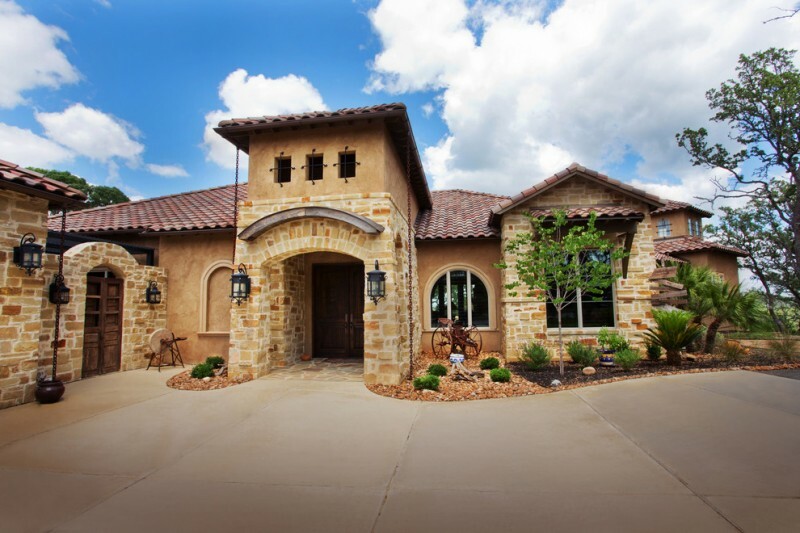 Just keep the most recognizable Tuscan’s characteristics to make your Tuscan house more alive. 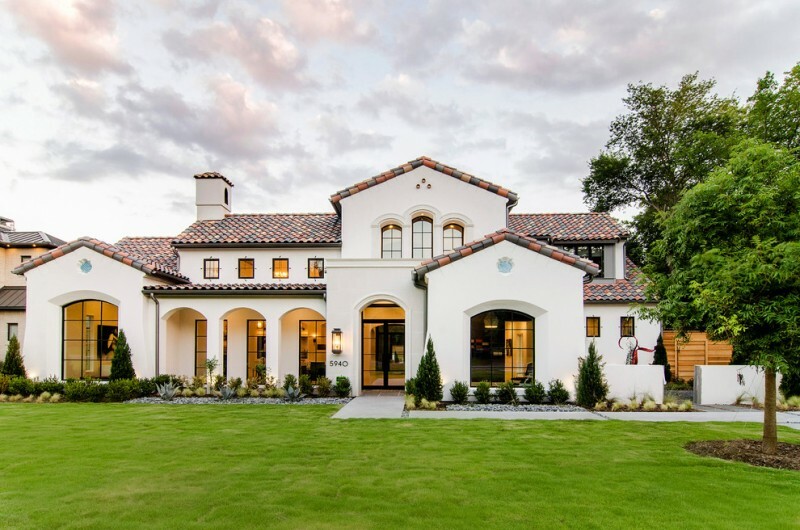 This house evokes Mediterranean style with vividly dark red terracotta tiles on roofs, carved limestone floors and pool’s frame, large and curved-top doors, and huge pillars. Palm trees and small garden growing under trees give strong characteristics of Tuscan’s garden concept. This house highlights mix modern-Tuscan influences. Glass panels installed on windows and doors are the real modern influence, while arched-top windows and doors, stucco walls, darker red terracotta tiles for roofs, and indoor courtyard are significant influences of Mediterranean concept. 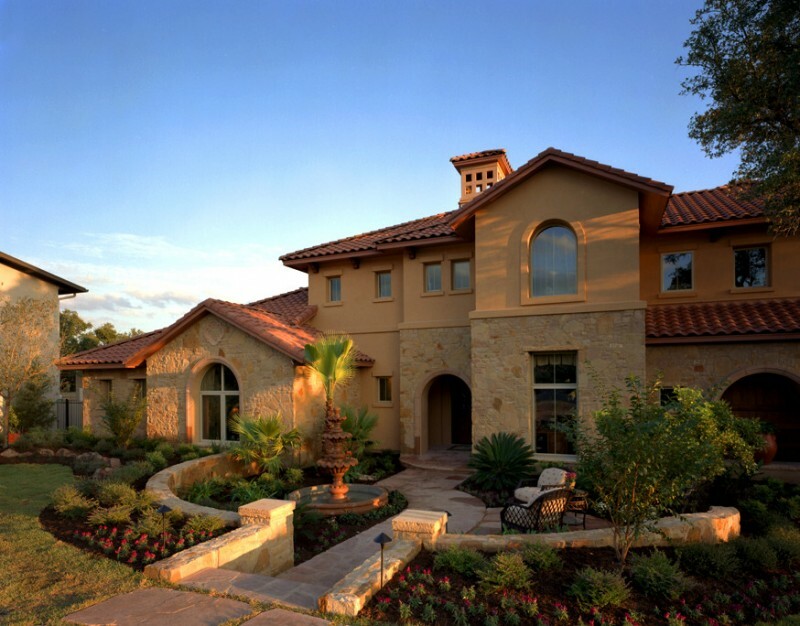 This is an idea of a Tuscan house style collaborated with Texas-Style. 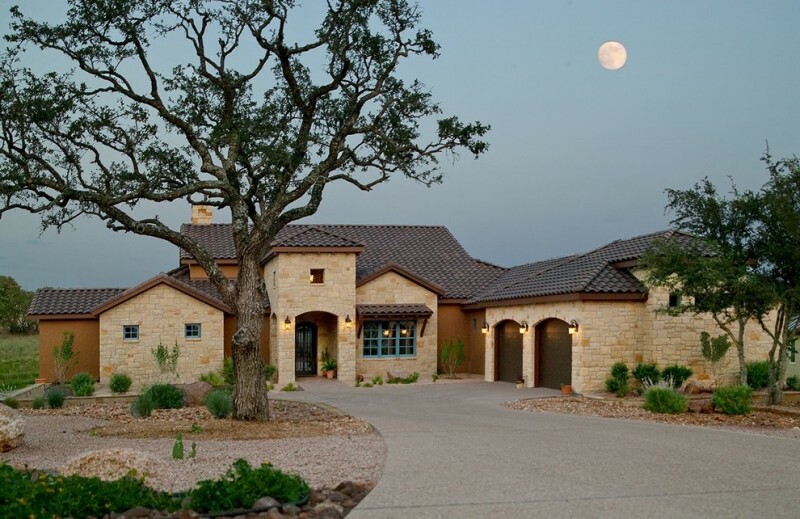 It’s just a little appeal of Texas and the owner keep Tuscan as the dominant influence. And, the most interesting thing is that the house uses zero landscaping idea to create a large and comfy driveway. It’s possible to cover a Tuscan house with light beige tone on walls. 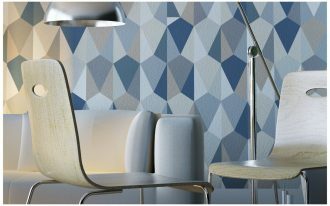 This tone obviously assists to optimize the effect of warm lights coming out the house, creating dramatic ambiance. 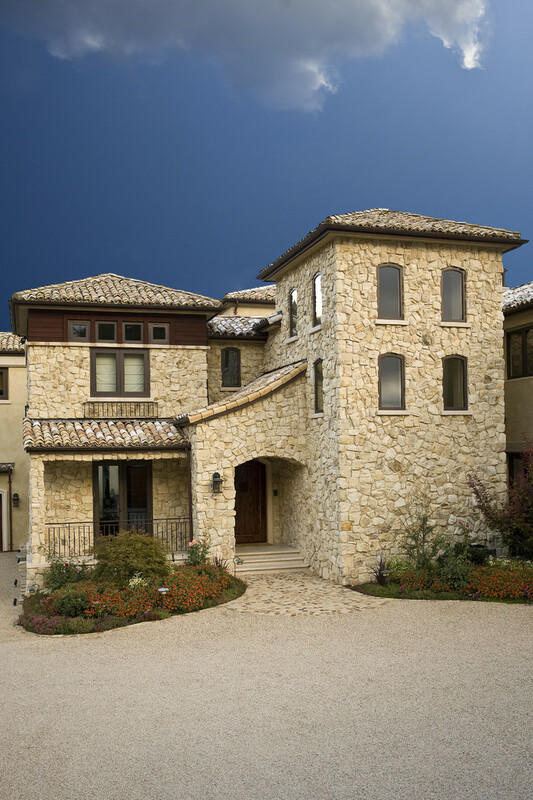 A mini Tuscan house with limestone walls wonderfully shows stonework in an Italian-style building. 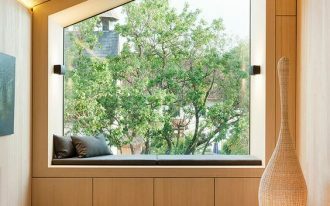 Attractively, the house is enlightened by beautifully dove-black windows panels and door frames. The door here is completed with transparent glass panel. 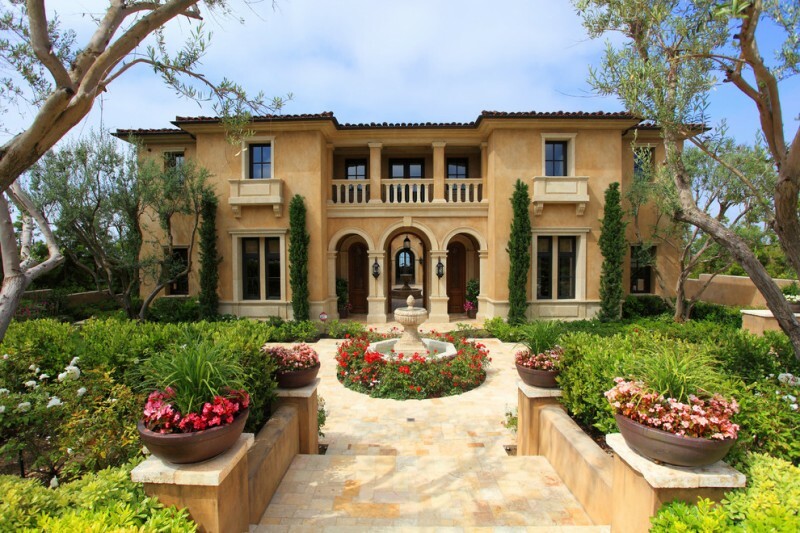 And, a Tuscany is still significantly recognized from terracotta tiles installed at the house’s roof. A fancy villa decorated on Tuscany. The building is as large as a real Tuscan-style house that’s identical with stucco for walls, terracotta for roofs, curved-top entrance gate and door, large yet narrow windows and doors, exterior/interior yard, stone floors, and warm-lights. These roofs are really in authentic Italian roofs, reflecting a real Tuscany. 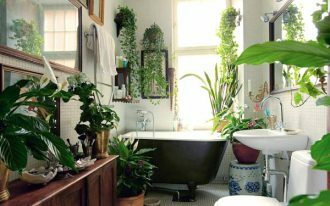 Terracotta tiles, moreover, add a strong accent commonly discovered in most Italian’s buildings, and we’ve found Spanish architectural influence here. Pool and living space furnished with simple yet stylish outdoor furniture set provide a comfy space to welcome or just to gathering with family or friends. 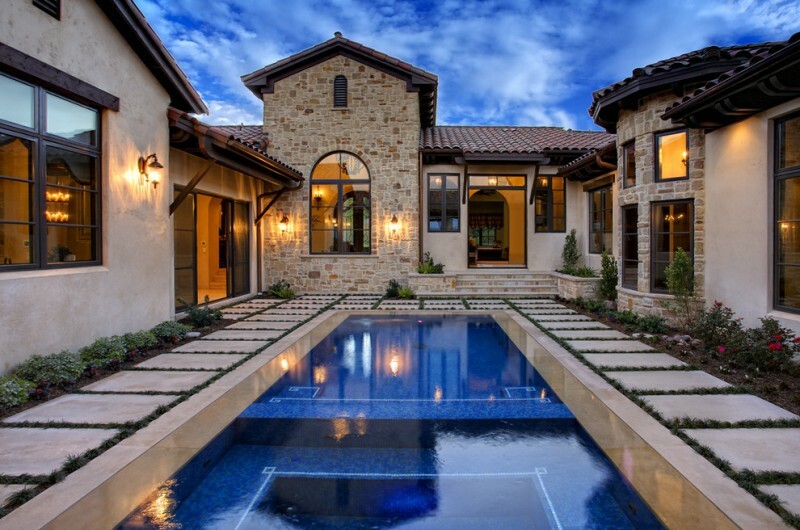 A Tuscan house with minimalist courtyard retreat and outdoor pool sounds fabulous. It’s unique as it blends two contrasting styles: Italian’s architecture and minimalist styles. In same time, we’ll find minimalist accent within a luxurious Tuscan living space. The estate consists of the main house and detached garage. The outdoor open space is furnished with a set of dark-finishing wood furniture shaded by greens growing along a semi-permanent metal roof. 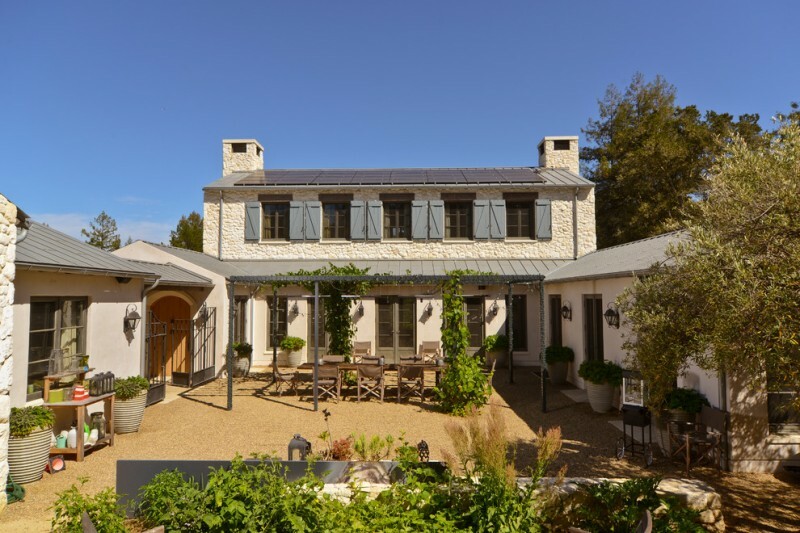 Stucco house still becomes the main concept, yet grey wooden slabs are used to replace Tuscan’s terracotta tiles. Why? These slabs are much more effective to attach and install the solar panels (the main electricity source for this Tuscan house). This one is quite unique yet attractive: a new idea of re-modeling a house in Tuscany. The remodel is begun by applying pale stucco for walls. It aims at creating a new appearance without missing Tuscany’s authentic style. Pale tone here is chosen to evoke other contrasting elements of house, like beautifully green courtyard, dove-black windows’ and doors’ frames, and deep-beige scheme found at exterior furniture. 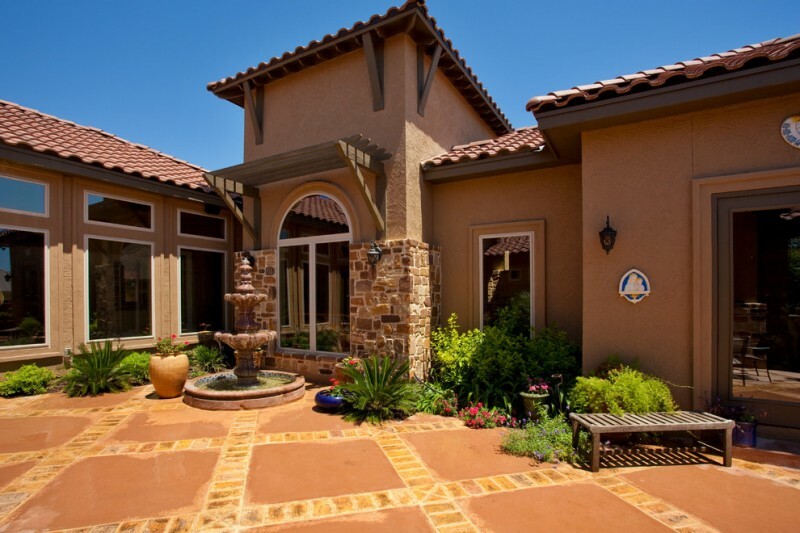 Dark and beige terracotta layout is a new way of building a new modern-Mediterranean house with Tuscan accent. Overall, the architecture still reflects the genuine Tuscany. A simple and tiny stucco house is also interesting. The house keeps striking and adapts all elements of Tuscan’s style. 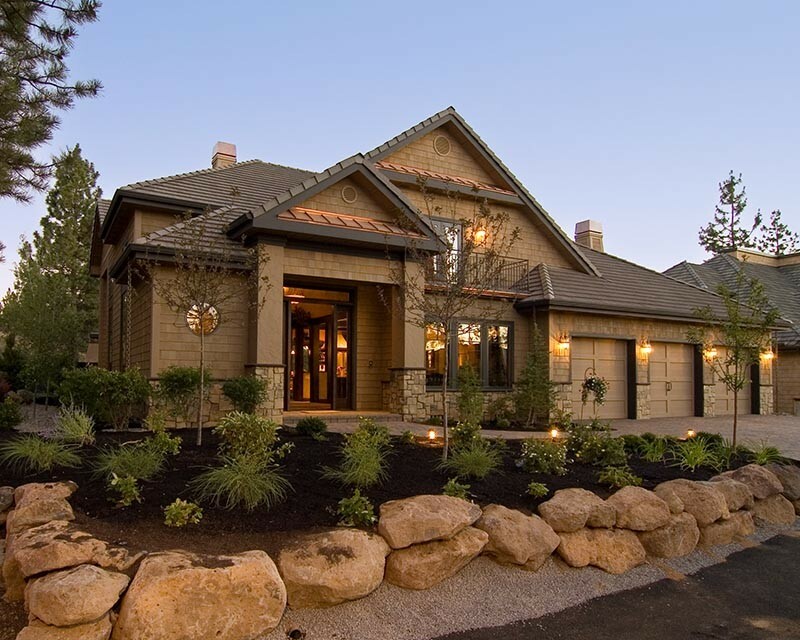 Rustic accent is gently collaborated in a Tuscan-style estate. Nature stones in beige garnish the house’s walls, while dark-finished wood used for windows’ frames and entrance door offers pretty contrasting look, after pairing it off with dominant beige walls. It’s always interesting to see how wonderful when a dream-Mediterranean & Tuscan style house is well-furnished with best exterior furniture set. 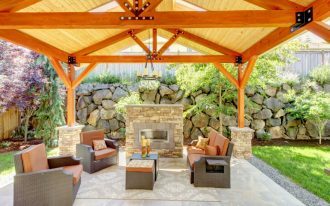 Like this picture, a set of comfy exterior furniture set is surrounded by well-maintained mini garden and stoned fences. 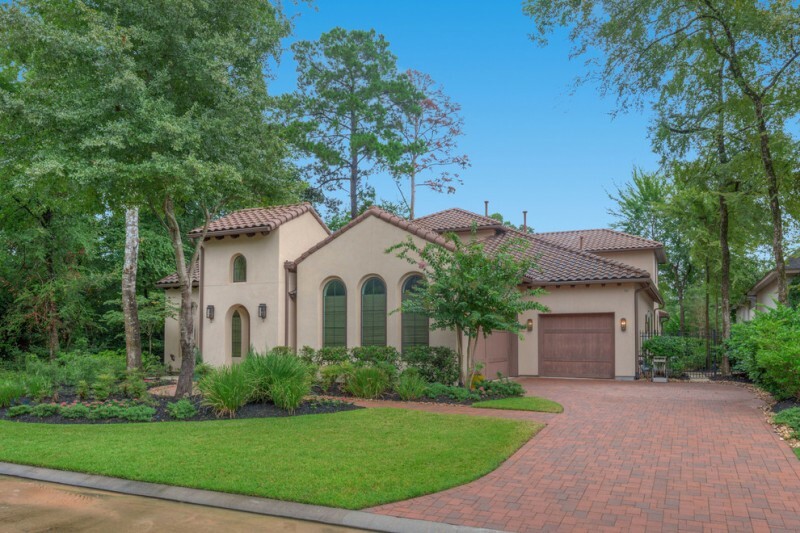 A Tuscan-style house is beautifully collaborated with exterior stucco and luxurious front yard with full of beautiful flowers. Grand balconies and curve-top doors add another luxury to this house. Lighter-beige color covering the doors’ and windows’ frames makes the house’s exterior more attractive. This idea is so simple yet attractive. 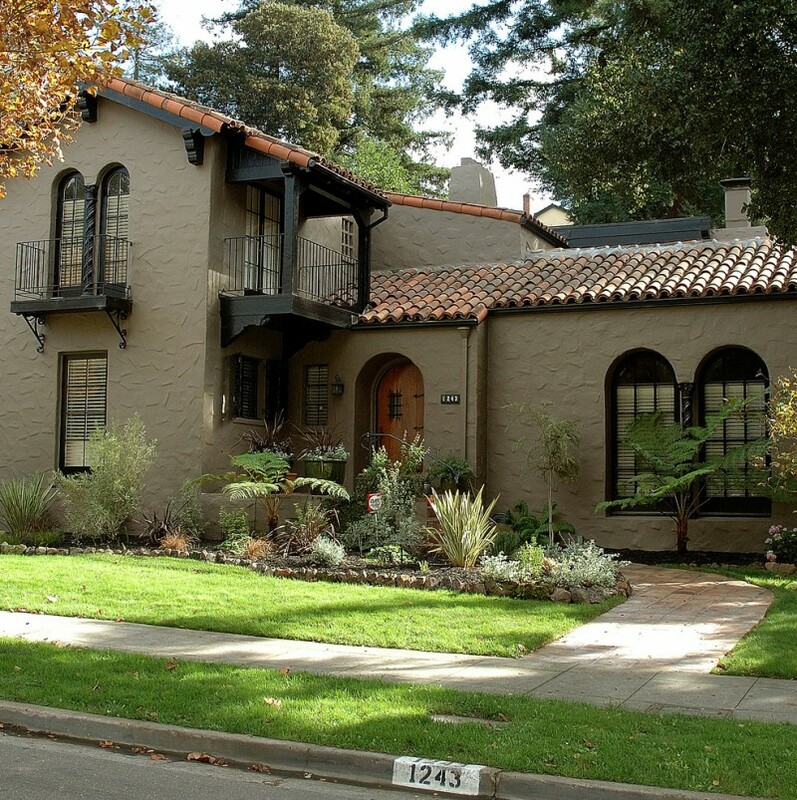 The owner loves stucco-finishing and mini-stucco house concept. Limestone floors give special accent for floors and path built in courtyard. ‘Juliet’ balcony offers a new attractiveness here. It looks so dramatic with black wrought iron rails installed in the first floor of house. Tuscan house isn’t always beige. It can use other neutral and natural tones for facade. Grey, for example, is also interesting and keeps bursting the Tuscan style. 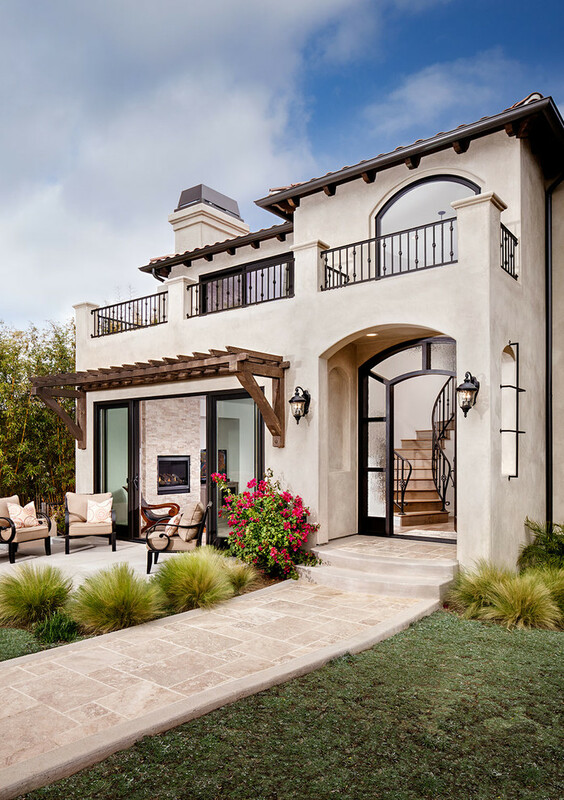 Grey stucco walls featuring dark-orange terracotta, black-finished railing system, and hardwood panels for windows and doors are so stunning. Agree?